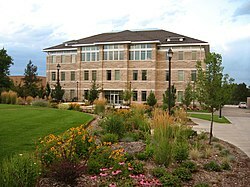 BYU-Idaho offers programs in liberal arts including the sciences, engineering, agriculture, management, and performing arts. The university is broadly organized into thirty-three departments within six colleges, and its parent organization, the Church Educational System (CES), sponsors sister schools in Utah and Hawaii. The university's focus is on undergraduate education, hosting 26 certificate, 20 associate and over 87 bachelor's degree programs, and it operates using a three-semester system also known as "tracks." The 1950s brought renewed consideration of closing the school, and possibly moving it. However, church president David O. McKay decided against this course of action after a visit to the campus. During the 1976 Teton Dam flood, Ricks College was used as a center for disaster relief operations. By the late twentieth century, the college had become the largest private junior college in the country with over 7,500 students. The campus sits on a hill overlooking the city of Rexburg and the Snake River Valley and includes nearly forty major buildings and residence halls on over 400 acres (1.6 km2). Off-campus facilities include a Livestock Center and the Henry’s Fork Outdoor Learning Center near Rexburg. The Teton Lodge and Quickwater Lodge near Victor, Idaho, are utilized as student leadership and service centers. In support of the fine arts and entertainment, the campus also includes the Ruth H. Barrus Concert Hall which houses the acclaimed Ruffatti organ,  the third largest organ owned by the Church after those housed in the Salt Lake Tabernacle and Conference Center, respectively. KBYI-FM, a 100,000 watt public radio station, also broadcasts to eastern Idaho and parts of Wyoming and Montana from the campus. The academic year is divided into three equal semesters (fall, winter, spring) of fourteen weeks and is known as the "three-track" system. It was instituted in 2001 as part of the transition from Ricks College to BYU-Idaho and the school's "Rethinking Education" campaign. When a student is admitted to BYU-Idaho, they are also assigned to a specific two-semester "track," (fall-winter, winter-spring, or spring-fall) based partly on preference, degree program, and availability to balance. Initially, the fall and winter semesters were slightly longer (and thus more heavily attended) than the summer semester and had more class options. Beginning in January 2007, the school adjusted the academic calendar  equalizing the amount of time available in each semester, lengthening the class periods, and opening class offerings in the spring to allow more students to attend in the spring semester. There is also a short, 2-month summer session with accelerated class schedules. BYU-Idaho also offers "fast grad" which allows students to attend all semesters and finish their degree sooner. This is usually available as an option to students who have an upper sophomore or higher standing. There were 17,980 full-time students enrolled at BYU–Idaho during the Fall 2016 semester. Students come from all 50 states and more than 130 countries. According to fall 2016 enrollment numbers, 27% of BYU-Idaho campus students came from the state of Idaho,  with the majority of students coming from five states: Idaho 27%, California 14%, Utah 10%, Washington 8%, and Arizona 4.5%. Thus, the student body at BYU–Idaho is notably homogeneous—not only due to its geographic representation but also due to ethnicity and religion. During the Fall 2016 semester, 83% of the students were Caucasian. Moreover, during the Fall 2016 semester, 99.7% of the students were members of the LDS Church. Known as the Vikings, Ricks College fielded an intercollegiate athletics program from 1919-2002 in the National Junior College Athletic Association, earning 17 national championships, 61 individual national titles, and producing nearly 100 first-team All-Americans. National title wins included Women's Cross Country (1994, 1995, 1996, 1997, 1998, 1999, 2000, 2001), Men's Cross Country (1965, 1966, 1986, 1999, 2000, 2001), Women's Track and Field (1997), and Women's Volleyball (1974; AIAW). More than 25 alumni who played football for Ricks went on to play professionally in the National Football League or Canadian Football League. The atmosphere at BYU–Idaho is different from most other universities due to its affiliation with the LDS Church. For example, almost every Tuesday that school is in session, a devotional is held on campus. During the devotional, no classes are held, administrative offices close, and students and faculty are encouraged to attend the hour-long worship service either in person (in the BYU-Idaho Center), via campus TV, or on the radio at KBYI 94.3 FM. Speakers are selected from the campus and local communities, as well as from church general authorities who share a spiritually uplifting message. The school's honor code also requires students to regularly attend church services, which are held every Sunday. 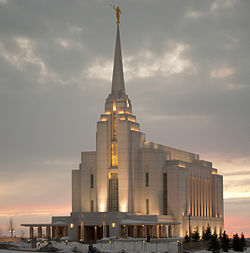 Until the construction of the Rexburg Idaho Temple in 2008, BYU-Idaho had been the only university affiliated with the LDS Church that did not have a nearby temple. Despite its transition from Ricks College to BYU-Idaho, leaders of the university have maintained the desire to preserve what they call the "Spirit of Ricks," a campus tradition of service, hard work, friendliness, compassion and cooperation. The school's relative geographic isolation from a metropolitan area, combined with the strong moral standards taught and encouraged by the school and its sponsoring organization, contribute to a unique student culture unlike that of many universities, but with some basic similarities to the other campuses owned by the LDS Church in Utah and Hawaii. Alcohol and drug use is virtually nonexistent, as these substances are strictly prohibited by the school's honor code and the Church. There is also no Greek system. Much of BYU–Idaho student life revolves around events sponsored by the school organization Student Activities, which frequently hosts dances, concerts, sports events, and service projects. Rexburg is situated in a strong northern climate in which winter dominates, and as such, winter sports such as downhill and cross-country skiing and snowboarding are popular. There are two nearby ski resorts, Grand Targhee and Kelly Canyon, which are frequented by students. However, Rexburg also experiences warm summers that are ideal for many outdoor recreational activities. The proximity of BYU-Idaho to both Grand Teton and Yellowstone national park, along with other state parks, national forests and nearby rivers make hiking, fishing, camping, mountain biking and river floats popular summertime activities. ^ "Fall 2018 enrollment figures show continued growth on campus and online". BYU-Idaho Newsroom. 26 October 2018. ^ "Facts and Figures". byui.edu. Archived from the original on 2015-05-11. Retrieved 27 April 2015. ^ "BYU-Idaho Color Guide". Brigham Young University–Idaho. Retrieved November 17, 2015. ^ "Quick facts". BYUI.edu. 2011. Archived from the original on 2011-05-08. Retrieved 2011-03-19. ^ a b "General History". BYU-Idaho. Retrieved 2008-08-09. ^ Crowder 1997, Chapter 4: "'Ricksie' Drops 'Normal'"
^ Andrew C. Skinner (2000). "Ricks College". Encyclopedia of Latter-day Saint History. Deseret Book. ISBN 1573458228. ^ Crowder 1997, Chapter 9: "'Lambing Sheds' for a Four-Year College"
^ Roundy, Jerry C. (1975). Ricks College: A struggle for survival. Provo, UT: Brigham Young University Press. ^ Prince, G.A. & Wright, W.A. 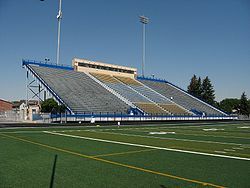 (2005). David O. McKay and the Rise of Modern Mormonism. Salt Lake City: University of Utah Press., p. 190. ^ Crowder 1997, Chapter 16: "Eyring, the Bicentennial, and the Great Flood"
^ "BYU-Idaho's steady, upward course continues..." BYU-Idaho. Retrieved 17 December 2008. ^ "BYU-Idaho Reveals Auditorium Drawings". Local News 8. 16 May 2007. Archived from the original on April 11, 2008. Retrieved 17 December 2008. ^ "BYU-Idaho Campus" (PDF). Madison County, Idaho. 29 July 2008. Archived from the original (PDF) on 2011-07-25. Retrieved 22 December 2008. ^ "David O. McKay Library -- Brigham Young University". librarytechnology.org. Retrieved 2016-02-01. ^ "Notable Ruffatti Installations". centralmusic.biz. Archived from the original on July 3, 2008. Retrieved 22 December 2008. ^ a b Faith. "President Henry J. Eyring assumes role as 17th president of BYU-Idaho". Deseret News. Retrieved 2017-05-01. ^ "Academic Colleges and Departments". BYU–Idaho. Retrieved 31 December 2018. ^ "Steady Upward Course". BYU–Idaho. Retrieved 2018-12-31. ^ "Preparing to Apply". BYU-Idaho. Archived from the original on 2008-12-21. Retrieved 17 December 2008. ^ Anthony Sheehan. "New 14-week semester may change housing prices". The Scroll. Archived from the original on April 12, 2008. Retrieved 17 December 2008. ^ "Admitted Students". BYU-Idaho. Archived from the original on 2008-12-02. Retrieved 17 December 2008. ^ "College Navigator - Brigham Young University-Idaho". ed.gov. Retrieved 27 April 2015. ^ "Official Enrollment Statistics". www2.byui.edu. Retrieved 2019-01-01. ^ a b "Celebrating a Century of Ricks College Athletics". Brigham Young University-Idaho. 2002. Retrieved 2018-12-31. ^ "Celebrating a Century". BYU-Idaho. Retrieved 2008-08-05. ^ Larsen, Kent (2000-06-22). "Winners and Losers In Ricks/BYU-Idaho Changes". Mormon News. Casper Tribune. Retrieved 2008-06-02. ^ Gower, Scott (2005-11-29). "Intracollegiate sports increase in popularity". Scroll Online. Brigham Young University-Idaho Scroll. Archived from the original on October 14, 2008. Retrieved 2008-08-06. ^ "What is a Devotional?". BYU Broadcasting. Retrieved 2008-08-09. ^ "About BYU-Idaho". www.byui.edu. Retrieved 2019-01-01. ^ "University Standards". Brigham Young University–Idaho. Archived from the original on 2010-10-14. Retrieved 8 October 2010. ^ "Renew Ecclesiastical Endorsement". Byui.edu. Retrieved 2017-05-01. ^ "Housing & Student Living". Brigham Young University–Idaho. 2014. Retrieved March 30, 2015. ^ "Alumni". Brigham Young University-Idaho. Retrieved 2008-08-05. ^ "Gardner bio". Brigham Young University-Idaho. Archived from the original on 2008-12-02. Retrieved 2008-08-05. ^ "Lindstrom bio". Houston Astros. Retrieved 2008-08-05. ^ Crowder 1997, Chapter 13: "New Buildings! New Status?" ^ Fowler, Glenn (1988-05-21). "Obituary: Marion G. Romney, 90, President of the Mormon Council of Twelve". New York Times. Retrieved 2008-02-03. Wikimedia Commons has media related to Brigham Young University–Idaho.